Earlier today, Apple released the fourth beta of iOS 7.1 to developers, which included both bug fixes and a few new changes to the operating system. While iOS 7.1 beta 3 introduced several visual changes, iOS 7.1 beta 4 focused more heavily on behind-the-scenes improvements. There were, however, a few tweaks to further streamline the look of iOS 7, which are detailed below. Slide to Unlock/Power Off: Most notably, the Slide to Unlock bar at the bottom of the phone is now more prominent, with a brighter, slower animation. The same brighter animation can be seen in the Slide to Power off bar when turning off the phone. Contacts in Dialer: The option to add a contact when entering a phone number has been altered slightly and is now executed by tapping the + sign next to the phone number. Previously, there was a line that said "Add to Contacts." Messages Scrolling: When scrolling through the Messages app in beta 4, it seems there is slightly more "bounce." This is in line with previous changes to Control Center, which introduced a bounce animation. Siri: In the U.K., there is a new Siri voice on the iPad. To check out previous changes introduced in iOS 7.1, make sure to take a look at our previous tidbits post on iOS 7.1 beta 3, which detailed a number of visual changes to the operating system. It is unclear when Apple plans to release iOS 7.1 to the general public, but a report from December suggested it could see a lengthy beta testing period with a March launch. It is likely that Apple will continue making subtle changes to look and feel of iOS 7 in coming betas, which could result in a refined and polished version of the operating system when it is finally made available to the public. How nice to see Jony Ive using his access to 500 million i-Devices as an opportunity to teach himself UI design !!!!! I know. If only we could have this back. This is proper UI design. The complaining in this thread makes me want to vomit. 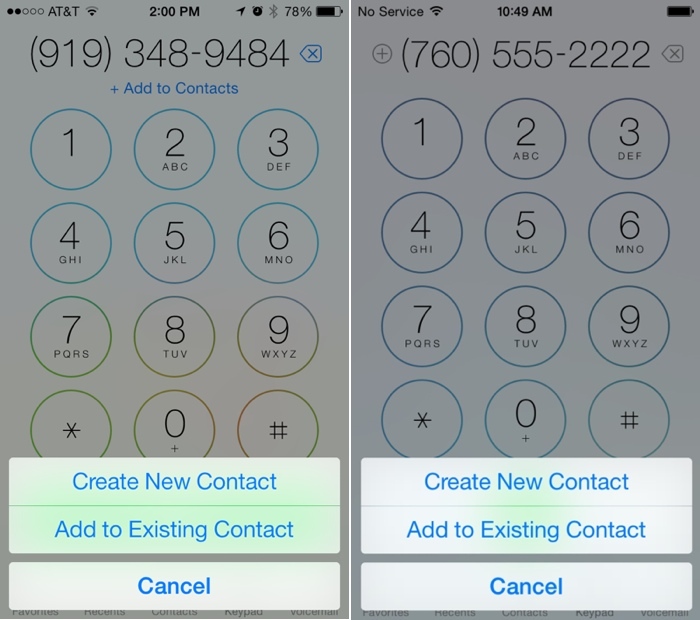 Honestly, the "Add to Contacts" text seems more in line with iOS 7's guidelines on "clarity". I know we all didn't like the amount of text-links instead of buttons, but now that we've all gotten used to it, going back to a simple "+" feels... not as good. Some of you people sure do put a lot of stock in stupid, silly-assed animations Just give me some solid app performance. I can close my eyes and ignore the hideous side of iOS if I have to. :rolleyes: Right.. because all skeuomorphic designs are that ugly. How about the original iBooks app? It looks a lot better than the crap they replaced it with in iOS 7. One change I would like to see in the dialer: the backspace button should be moved back down to the keypad. That tiny "X" up to the right of the readout is counter-intuitive and clunky to use.